The What: AirNetix will show StreetSounds, a new streaming wireless audio system designed to provide professional quality audio for “Main Street USA” at its InfoComm booth, C11932. The What Else: StreetSounds consists of a 900MHz wireless radio, an internal 70-watt two-channel audio amplifier, weatherproof speakers, and mounting brackets designed for simple mounting to a streetlight or traffic light pole. 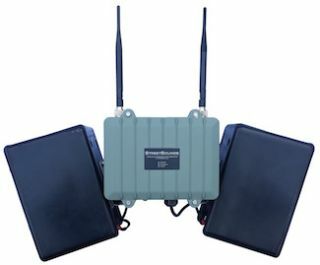 The wireless radio is a “multi-hop repeater” and is based on the proven AiRocks Pro products currently being sold by AirNetix in to professional audio market. The novel repeater architecture is designed to give StreetSounds virtually unlimited range and coverage so that large downtown districts, parks, shopping centers, recreation complexes, theme parks, and historic districts can be covered by real-time audio. StreetSounds is housed in a rugged aluminum enclosure designed for permanent installation and built to withstand harsh outdoor environmental conditions. The wireless system is remotely controlled and monitored from a central PC running the Network Management System (NMS) application. The NMS gives the operator control over each wireless unit so that either individual units, or groups of units (zones), can be turned on or off and volume increased or decreased from the central management location. All critical operating parameters, such as receive signal level, audio level, and internal temperature can be monitored to provide alarms or service information.